August 13, 2018 August 5, 2018 / Elizabeth T.
Though yellow isn’t one of my typical color choices when it comes to clothes, there’s just something about wearing it in the summer that just seems perfect! The color is the literal embodiment of the bright sun and summery weather, and it’s such a fun way to brighten up just about any look, don’t you think? I tend to lean towards neutrals throughout the year because I just find these colors more classic and timeless, which means they’re more versatile in terms of mixing and matching too. This year, I’ve been trying to incorporate more colors into my wardrobe, so I couldn’t help but gravitate towards this summery yellow hue now that we’re in one of the hottest months of the season! If you’re still not convinced that you need this bright and happy color in your wardrobe, read on to see why yellow is the new “it” color of summer! When you think of the sun, you immediately think of summer, right? And summer just embodies so many fond memories of youth, don’t you agree? From lazy afternoons by the pool, to endless days running around the fair, there’s just something about the summer sun that makes me feel more free and young! Whenever I wear yellow, I’m just reminded of all this, and it’s a color that instantly puts a smile on my face! Needless to say, yellow is one of the brightest colors on the color wheel. And because of its bright nature, it definitely helps bring that “light” to just about any outfit, don’t you think? Even on the gloomiest of days, yellow still manages to brighten up your mood, making your outfit instantly more fun! And of course, no one can deny that yellow actually gives off an unexpected high-fashion, street style vibe that’s inimitable. Sure, reds, mustards, and green may be more “popular” choices when it comes to bright hues, but yellow definitely stands out from its peers because it’s vibrant, bright, and an immediate attention grabber! What do you think of the color yellow? Are you a fan of this bright and youthful color? And how do you usually style this fun hue? Let me know in the comments because I always love hearing from you! Splending, worthy of kneeling for Mz!! Aww you’re too sweet! ❤ 🙂 Thanks babe! Oh yes yellow is fun. They say it is hard to wear but I love it. I bought yellow trousers and a yellow beach dress this summer. This tee is super cute and look amazing on you! Such a cute look AND a cute tee!! 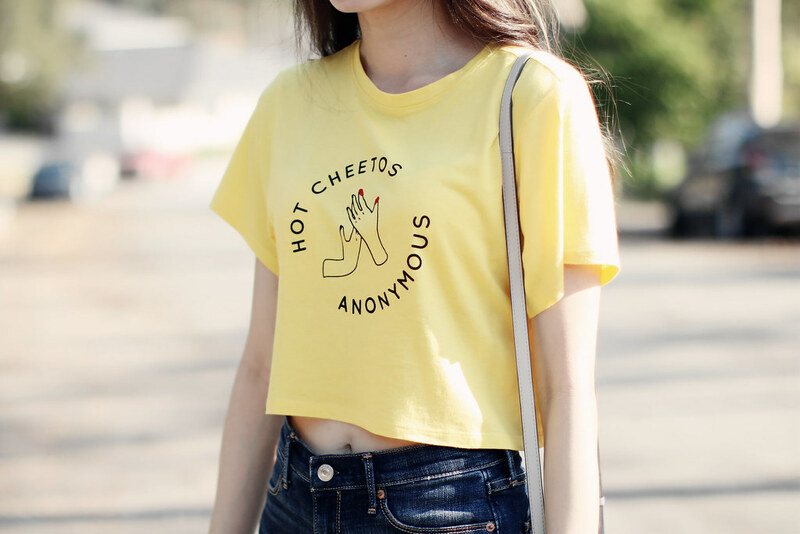 Super cute t-shirt! Loving the look! Totally love this casual outfit on you! And yellow suits you well! I love yellow, especially during the summer. It definitely adds to an outfit! I have been wearing yellow all summer long hehe! Alessandro e Alice per Absorba is perfect. Yellow is a very original color, perfect for summer season!!! Thanks babe ❤ You're soo sweet! Super cute look! I love this fun tee! Your outfit looks so comfy and cute. I like your top. I agree with how you described yellow and you look great in it!